Most of our members only make day-use of Bare Oaks but for those who want a longer getaway and for out-of-town visitors, we offer several types of accommodations. We have several rental cabins available. Click here for rental cabin details. We have both 3-services (water, electricity & sewage) and 2-services (water & electricity) campsites. The 3-services sites are located Helios Circle while the 2-services sites are in the Beckett Circle area. But those with 2-services camping can use the flush toilets and hot showers in the comfort station. For those RV campers who prefer to use their own facilities, a dump station is also available. Click here to read our camping-specific regulations. With 50 acres, Bare Oaks has nearly unlimited space for low-impact tent camping. Tent sites do not have any services (some tenting locations may be close enough to an electrical outlet to run an extension cord) and vehicles cannot be parked near the tent. However, some tent sites can offer enchanting natural surroundings and unparalleled privacy. Userviced Camping with vehicle – You camp with your vehicle on Glen Echo field. The ground is hard enough to support cars and trucks. 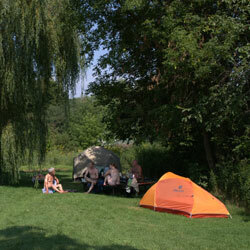 Lawn Camping – You can select a camping space on the lawns that surround our ponds. The camping site will be relatively close to washrooms & showers. Forest Camping – This is wilderness camping in our unspoiled forest. You will be surrounded by nature and, depending on the site you select, you will be almost completely isolated. The downside is that you will be far away from most amenities. While reservations are not required, they are recommended. Guest rooms, rental trailers and serviced campsites are sometimes fully booked. To reserve, either call: 1-888-373-9124 (toll-free in Canada & USA) or +1 (905) 473-6060 during regular business hours.